Win has expanded its social casino catalog with the launch of Stardust Casino on iOS. 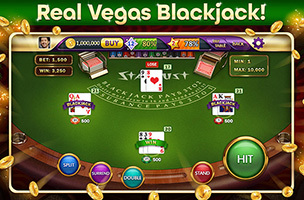 Developed in partnership with leading casino entertainment company Boyd Gaming Corporation, Stardust Casino offers players a look at “vintage” Las Vegas, as they play slots machines, blackjack, roulette and more. As the name suggests, Stardust Casino takes players to the lobby of the original Stardust Resort and Casino. Players earn experience points as they wager virtual money on the game’s slot machines or table games, working their way to becoming a High Roller. Players’ progress is tracked on three leaderboards, and everyone has a chance to win large Superstar Jackpots, even if they’re not currently on a winning streak. The game’s social features allow for the sharing of gifts like chips, bets and spins with friends, as well as sharing progress on social media via status updates. The game is set for future updates on both iOS and Facebook, including the upcoming launch of social tournaments. Stardust Casino first launched on Facebook in September 2013. Since its launch on the social platform, gamers have played the slots more than 22 million times, have played more than 650,000 hands of blackjack and have bet on almost 200,000 spins of the roulette wheel. Stardust Casino & Slots is now available to download for free on iOS. Check back soon to follow the game on AppData, our tracking platform for mobile and social apps and developers.